Melanoma happens as a reaction to spending too much time in the sun – or more specifically, an overexposure to ultraviolet light. UV light consists of high-frequency waves that can damage living tissue. Protecting your skin from direct sunlight is by far the most effective way to avoid melanoma. Stay in the shade, especially during the warmest hours of the day between 12 AM and 3 PM. Cover your most vulnerable areas with clothing. Make sure your back, shoulders, arms, and legs are as protected as possible. Wear a hat. Broad-brimmed hats are the best choice. It’s portable shade! Cover any remaining exposed skin with a broad-spectrum sunscreen every two hours, and again after swimming or exercise. Broad spectrum sunscreen protects the skin against both UVA and UVB sunrays. Melanoma can also affect your eyes! Put on some sunglasses. Awareness of how to stay safe is the first step in avoiding melanoma. It is also vital to check any moles that you may already have. skinScan is a great app for your phone that’ll help you get there. 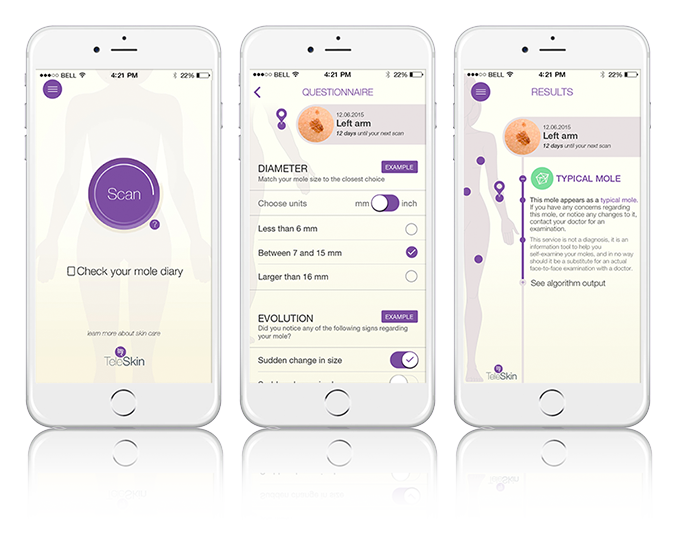 skinScan analyzes images of your skin, and helps you track you moles over time.